Suzie G, one of Australia’s top violinists has wowed audiences all over the globe… combining classical training, beauty, and musical flare. Suzie G is the musical/artistic director of Maske Music. She holds a Post Graduate of Music from the Hong Kong Academy of Music, a Bachelor of Music and a Diploma of Music from the QLD Conservatorium. She also holds an A.MUS and L.MUS of Music majoring in Violin. 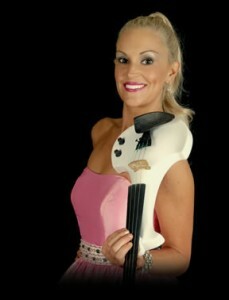 Suzie began performing at age 5 with the Suzuki school in Perth, Western Australia and has gone onto perform as a freelance musician with the QLD Orchestra, Hong Kong Philharmonic and the Melbourne Symphony. Copyright © 2019. Suzie G. All Rights Reserved.